Stunning plantation shutters Harpenden, we make the most of your windows and doors! Our local shutter expert Tom Parrott brings our trusted quality and service to Harpenden and the whole of the Hertfordshire – 01727 221298. Tom is a shutter specialist; it is in his blood! His family business in Florida specialises in beautiful interior shutters. Tom, a Hertfordshire local, now brings his passion for shutters and eye for design to the region. Whether in town, or overlooking one of Harpenden’s abundant parks or greens, there is no better window covering to make the very best of your home. Plantation shutters offer practicality, versatility and style like no other traditional window covering. Over and above your off the shelf curtains and blinds, all our shutters are perfectly designed and fitted to your exact requirements and come with a lifetime guarantee. You can have peace of mind for as long as you own the shutters, knowing you will also have our Just Shutters expert support. Other benefits of shutters include the practicality – they are of course hard wearing and do not fade or warp with light or heat, they offer privacy and added security and value to your home, and of course they are stylish and beautiful. For further information please book an appointment now, call us on 01727 221298 or request a brochure. 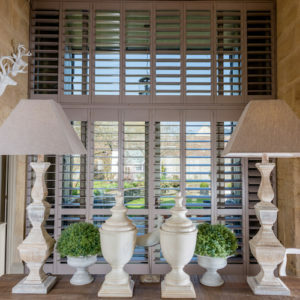 To get inspired by our Plantation Shutters Harpenden, please browse our shutter images. Whilst shutters are a luxurious product made from the finest materials and designed and fitted by experts, they do in fact offer incredible value. Unlike cheaper alternatives such as curtains and blinds, they are a long lasting guaranteed product, meaning long after curtains have bleached in the sun, or simple venetian blinds have been damaged by temperature change, shutters are still looking as beautiful as the day they were fitted. Just shutters have earned a superb reputation, since our birth in 2006. Since then, we have strived to put customer satisfaction at the heart of what we do at Just Shutters. Therefore, we are incredibly proud to have achieved a 9.9/10 rating on Checkatrade. This rating comes as a result of 1700+ independent reviews, read some examples of them below! The service was excellent, very polite, so neat and tidy work. Fitting six windows and one door shutters Hertfordshire. Excellent product by a helpful, tidy and professional fitter. New shutters to 6 windows. Total service from quote to installation. Kept in touch and shutters look amazing so happy. Absolutely faultless! Shutters in Hemel Hempstead. The best customer service I’ve come across in years and a fabulous investment for our home. Plantation shutters fitted to patio door. Very fair engagement and deliver excellent fitting and finish. First class in all areas and also good value.